I was blindsided the next year when the next David Bowie album appeared in scant months following the strong “Heathen” album. Not since “The Buddha Of Suburbia” snuck out mere months after “Black Tie, White Noise” in 1993 had Bowie been so prolific. I had loved “Hours…” and certainly had enjoyed “Heathen” but I could not bring myself to buy the new Bowie album sitting in the bins. It seems strange now, but it all came down to both my and my wife’s reaction to the cover art. It was off-putting in the extreme to both of us. I can’t say that there was a worse album cover from this artist. Imagine one so wanting that it did the unimaginable and actually prevented my purchase of the latest album by an artist I had over 20 albums of in my Record Cell! This is known as extreme design failure. Brrrr! How the anime-influenced cover art managed to make most anime [not my favorite thing by a light-year long shot] look better by comparison! Another bad illustration from Rex Ray, and some unusually poor decisions by designer Jonathan Barnbrook. My wife and I would be in stores, browsing the “Bowie” sections, and it would be there, lurking. We’d pick it up; after all, it was the new Bowie album – it’s what we do, and then cluck our tongues in distaste and put it back. No sale. It had to be some time in 2004 when we saw it in the used bins in some store when we finally thought we could check it out. I actually think it was my wife taking the plunge, if memory serves. We were in a record store downtown, possibly Voltage Records, or its predecessor [the name escapes me now] when we bought it and I distinctly remember popping it in the CD player when we got back to the parking garage and drove home. Truth be told, we were both dying to hear what Bowie’s take on “Pablo Picasso” was going to sound like. It might have been the one fact that made us ultimately buy the album. It was a terrific radical re-think of the classic tune that, quite frankly, never sounds bad in any version. The tune was just so unique and creative that it was always going to sound great no matter what the interpretation ended up being. In that respect, it was probably up there with Cheap Trick’s “Surrender,” as another song I’ve never heard a bad version of. In both song’s case, I don’t think it’s possible. The rest of the album wasn’t bad, either, but it definitely was a rock album with touches of art instead if what “Heathen” brought to the table; an art album with touches of rock. I liked the single “New Killer Star,” [perhaps a backhanded tribute to George W. Bush?] and the rocking “Never Gonna Get Old” but the album touched on the “Hours…” vibe for “The Loneliest Guy” and really went places with the urgent “Looking For Water,” which was an immediate favorite. Following that the album plateaued and began to slip down the ladder of relevance with each song. The weakest sauce here was definitely the George Harrison cover, “Try Some, Buy Some.” The twee keyboards sure didn’t help it any, but I felt that the tribute to the recently deceased Harrison was perhaps another ill-advised cover of a song written by a Beatle. Then at the end of the album, its ultimate payload was delivered. From out of nowhere, on a rock album of modest charms came, finally, a full-bore excursion into jazz from the man who had name-checked jazz for a long time but had only peripherally brushed it on rare occasions. “Bring Me The Disco King” immediately became my favorite modern [post-1980] Bowie song. After using jazz pianist Mike Garson for years in his band, he finally let the man do what he does best in his normal context. The long, 7:45 composition was smoky, crepuscular jazz of a fine stripe that made me eager to hear more. I soon began listening to this track happily on repeat for long hours at a time in an effort to sate my thirst for it. How I strongly wished at the time that it was the stylistic pointer to where Bowie would go next! I could hardly wait for more jazz – a full album, perhaps, from this performer. He sure seemed ready for it, judging by the elegant results here. 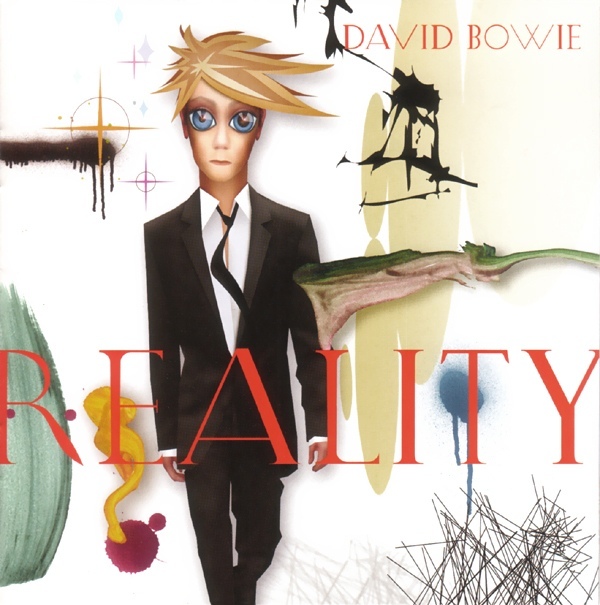 This entry was posted in Bowie, Core Collection and tagged 2003, David Bowie, Jonathan Barnbrook, Reality. Bookmark the permalink. I have to agree with you on the album cover – Big Eyes Bowie makes no sense to me. I’ve always wondered if there is some cold war allegory I’ve missed in the cover art. But WOW what a great record. New Killer Star is one of 2 post 9/11 referencing songs that I always gravitate towards – David Sylvian & Ryuichi Sakamoto’s 2003 World Citizen is the other one and you can’t escape the Bowie influence on that track. Pablo Picasso is just brilliant. Never Get Old feels like an idea that may have it’s roots in Berlin. The Loneliest Guy is pure introspective Bowie – a side we would hear more from, eventually. Looking For Water is a reminder to all the Suede’s and Blur’s out there who came first. She’ll Drive A Big Car reminds me of Lodger in many ways. I don’t have much to say about the Harrison cover. It’s a Harrison cover. The title track tries a bit too hard but there’s something good at it’s core. But Bring Me The Disco King was mindblowing. It was to date, the most New York City sounding song Bowie ever recorded. 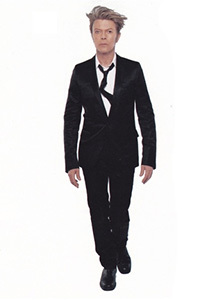 It provides so much promise of a new direction and artistic adventurism for Bowie. Most albums end with a track that resolves the album, but for me Bring Me The Disco King left me both filled with an anticipation and artist adrenalin. It created questions in my mind, not resolutions. I was SO ready for more. Echorich – As were we all! To no avail. Huge fan of both Heathen and Reality. Although he wasn’t exactly prolific in this decade, I prefer his work in the ’00s to the ’90s.